The Buffalo Bisons are giving their great fans a new way to join 'The Herd' this season at Sahlen Field. The club today unveiled the all new 'The Herd' Membership Club that adds even more flexibility and savings as they plan for another summer of fun and excitement at the ballpark in 2019. 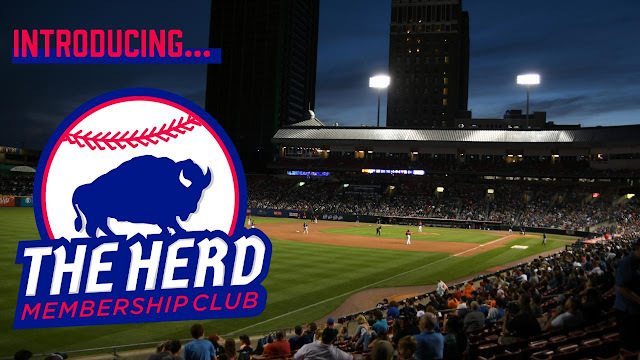 'The Herd' Membership Club -the Bisons first ticket membership club- gives fans four undated flex tickets for each month of the season (20 total tickets) with added ballpark 'perks' that add even more value to each trip to the ballpark, from free concessions to gift shop savings. The Herd club members are also eligible to win exclusive prizes throughout the season, and with memberships costing just $222, each membership is a savings of over 40%. 'The Herd' Memberships are perfect for companies, families or individuals. The tickets included are flex tickets, which means all four tickets for each month can be exchanged in any combination (four tickets for one game, one ticket to four games, etc.) with the only blackout dates of June 8 and July 3. The monthly perks can also used in any combination and prizes will be drawn at the end of each month. Opening Day at Sahlen Field is only 52 days away as the Bisons host the Scranton/Wilkes-Barre RailRiders on Thursday, April 4 (2:05 p.m.). Along with 'The Herd' Membership Club, all season tickets, ticket packages and group and party areas are on sale now at Bisons.com.